← London Shuffleboard Club Information update. Hello Bill: I am responding to your recent e-mail in which you requested information from Ontario shuffleboard clubs. I noticed the courts during a visit in April of 2014 and spoke to those in charge about resurrecting the game/sport. It was a bit of a struggle as we had no budget. However, cues were found and thanks to Rendall and Myrna Bilton of Elora and Ernie Thomas of Niagara Falls, discs were donated. The St. Mary’s Club also donated discs but they were unsuited to our floor. Yours truly repaired old, home made score boards which were found in a storage bin outside of the Seniors’ Centre and experimented with beads, wax and corn meal to find the right beading compound. In late June, 2014 we opened for business (Thursdays from 1 to 3 p.m.) and to state we got off to a slow start would be an understatement. However, we persevered and eventually attracted some interested shufflers. At the moment we have 15 seniors who have come out. We only have 3 courts so we are not looking for huge numbers but a few more players would be nice. We took a photo of some of our players on Thurs. June 18 when only 7 players showed up. We usually attract a few more every Thursday. 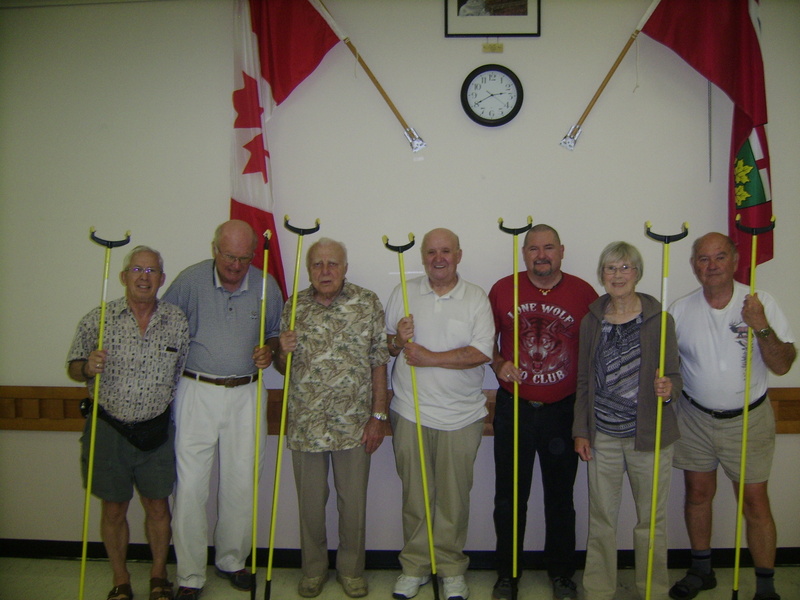 Members of the Seniors’ Centre are charged $1 each time they play. It is fun, our courts are fast and we seem to enjoy each others company. Plus, play has really improved! If we can get our numbers up, we will be trying "Black & Gold", "Singles-Mingles" and "Hoss Collar" games from time to time. going for the seniors. You have smiles on your faces. John, you are an inspiration to the game of shuffle, like they say, build it and they will come. Great effort ! I,m lnt.playing shuffleboard ,when do start . Hubert – I wold have to ask where your home is, then I can direct you to the closest club.